One of the first things I think of when I think of summer time is fruit salad. The light and sweet tastes of ripe fruit says summer time like nothing else to me. To stick with Joe’s Sports Graduation Cake, which included a baseball and basketball I carved a watermelon for the very first time into a Baseball Mitt Fruit Salad Bowl! SO CUTE!! Such a fun Summer idea!! Looks great and delicious too! A good theme is NOT wasted on you! I love it!!! Looks great! My mother always did a basket with handle for our summer parties. I've never attempted any! Love your photos! Well that is just the coolest! Super cute!!! I pinned a watermelon shark! I cannot wait to try it out! I've just carved your basic watermelon basket. This is so much cuter! 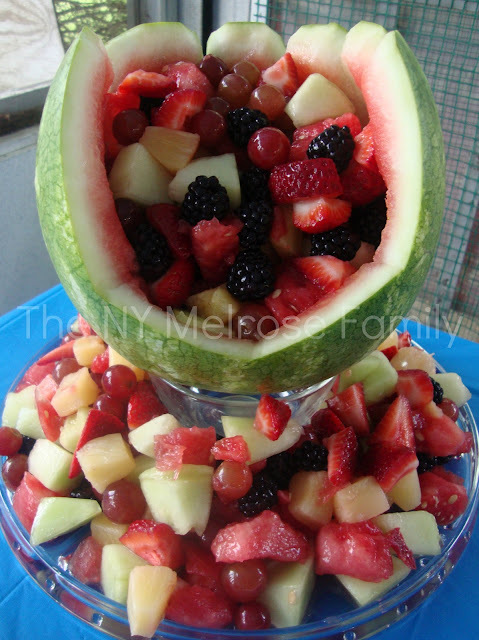 Jenny this looks so good, I LOVE fruit salad in the summer, and the carving of the watermelon is wonderful, thanks for linking up at Heavenly Treats Sunday! Oh, too fun! I've seen watermelon bowls before, but never a mitt! Glad you shared at Shine on Fridays! This is super cute! I found your blog through Somewhat Simple blog party and I would love to invite you to share this, and any other posts, at my Creative Thursday Link Party (open through Monday each week) at http://www.michellestastycreations.blogspot.com. Have a wonderful weekend. Jenny, Thanks so much for sharing at Creative Thursday. I am a new follower of your blog as well and will definitely be back on Wednesday to link up to your party 🙂 Have a wonderful week. Love this,would love you to share it on my Creative Monday hop? This is just too cool! Love it! Thanks so much for sharing at Mom On Timeout! If my daughter's team wins her division I will definitely make this… great idea. Thanks for putting it on foodie friday. Totally clever! And your fruit looks heavenly! This is such a cute idea! I really love that you could cut the watermelon into any shape that fits the theme of your party and use it as a fruit bowl. Thanks for sharing at Showcase Your Talent Thursday! So cute, Jenny!! I love it! I didn't carve it myself but I have seen the baby carriage fruit bowls. Thank you for sharing at Sharing Saturday!! That is just the cutest thing ever! Makes me so hungry for some watermelon now!. So glad you linked up at Sunday Blog Love. This is a really great idea Jenny! Thanks for the great idea! I made this today to take to my son’s team party to celebrate the end of his All Star season. It turned out really well. I added a little different webbing by scoring up and down, about four lines each way, and then scraping the outside dark green off in small squares every other square, like a small checkerboard.